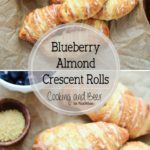 An amazing breakfast or brunch with blueberry almond crescent rolls. Preheat your oven to 375 degrees F and line a large baking sheet with parchment paper or a silicone baking mat. Set aside. In the bowl of your stand mixer, with paddle attachment fixed (or a handheld electric mixer may be used), combine the cream cheese, blueberry jam, 2 tablespoons of confectioner's sugar, flour, salt and 1/2 teaspoon of almond extract. Mix until smooth, about 30 seconds. Set aside. Lay your crescent roll wedges out on a large work surface. Take about a tablespoon of the cream cheese mixture and dollop it on the wide end of each crescent roll. Roll them up until the narrow end is sealed underneath. Transfer them to the prepared baking sheet and brush them with the egg wash. Sprinkle with turbinado sugar. Place the crescent rolls in the oven and bake for 13-15 minutes, or until puffed and golden. Remove from heat and transfer to a wire rack to cool. While the crescent rolls are cooling, prepare your glaze. In a medium bowl, combine the remaining 2/3 cup of confectioner's sugar, remaining 1/2 teaspoon of almond extract, and milk. Whisk until smooth. Adjust seasoning by adding a pinch of sea salt if you find that the glaze is too sweet. Drizzle the glaze on the slightly cooled crescent rolls and serve immediately. Enjoy! You may find it helpful to refrigerate the crescent rolls after you have rolled them up. This will help with any of the filling oozing out the sides. They are also a great recipe to make ahead, refrigerate for a day or two, and then pop them in the oven when you are ready to serve.